Noelle has lived in Charlotte since 2005 and came via South Carolina, Southern California, Northern California, the Chicago area, and five locations in Texas, Michigan and Canada. ln 2017, Noelle was recognized as one of The 50 Most Influential Women in Charlotte. She been an active member of the Charlotte Chamber of Commerce since 2007. She serves on the Business Advisory Committee for the Charlotte City Council since 2012. In 2011, Noelle was honored to be the first recipient of the Charlotte Chamber’s Ken Akers Award as Volunteer of the Year. She is also a wonderful advocate for her neighborhood and for Charlotte as a whole. I am proud to call her my friend and am honored to have received her endorsement. I endorse Patsy Kinsey for re-election to City Council. She has lived and worked in Charlotte all of her life and she has first-hand knowledge of the city’s history. She has the experience it takes to be an effective member of the Charlotte City Council. Patsy and I first met about 7 years ago and she has been my representative and she has been a friend to me and my neighbors. She not only comes to our barbecues, she came to my wedding when my wife and I of 14 years were finally able to be a legally wedded couple in 2014. 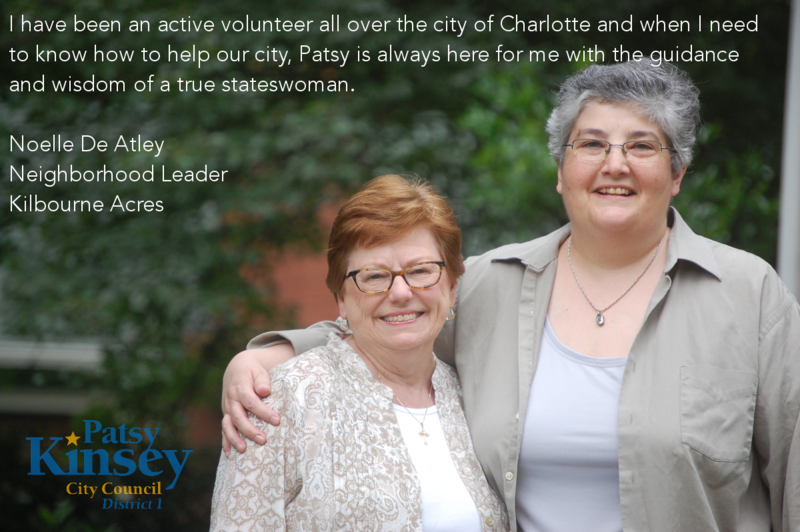 I have been an active volunteer all over the city of Charlotte and when I need to know how to help our city, Patsy is always here for me with the guidance and wisdom of a true stateswoman.